Sunnyvale, Calif. – February 19, 2013: Vitria Technology, Inc., The Operational Intelligence Company, today announced availability of Vitria Operational Intelligence 4, the only unified platform that combines continuous, real-time analytics™ on Big Data, streaming events, and business processes to enable immediate action. Vitria OI 4 is the only elastically scalable Operational Intelligence (OI) platform that can effectively address continuous, real-time Big Data challenges of any size. “Now faster and more flexible than ever, Vitria OI 4 provides the performance and scalability that telecommunications service providers, energy utilities, financial services firms, and agile enterprises need to turn Big Data into intelligent action,” said Dr. JoMei Chang, CEO of Vitria. Continuous, Real-Time Big Data Analytics: Vitria OI 4 delivers continuous, real-time analytics™ on Big Data, in motion and at rest. Users can now compare, combine, and correlate a wide variety of data from Hadoop to social media streams in a single, Live Dashboard. Elastically Scalable Operational Intelligence Architecture: Vitria OI 4 provides elastically scalable OI to meet real-time Big Data challenges of any size, with ease. Available on-premise or in the Cloud, Vitria OI 4 is the first multi-tiered, clustering Operational Intelligence architecture. Advanced Process Intelligence: Vitria OI 4 provides Advanced Process Intelligence for the continuous, real-time monitoring, measurement, and improvement of process outcomes. With Vitria OI 4, users gain visibility into hidden processes as well as insight from a 360-degree view of the business, in real-time, to enable immediate action. Leading use cases for Operational Intelligence range from mobile customer monitoring and customer experience management to real-time network monitoring, demand/response management, order-to-cash and performance management. Learn more about Vitria Operational Intelligence 4 at www.vitria.com. Vitria Technology, Inc. provides the industry’s leading Operational Intelligence platform, empowering partners and customers alike to develop innovative Operational Intelligence solutions to analyze Big Data, streaming events, and business processes in the proper context and take real-time action. 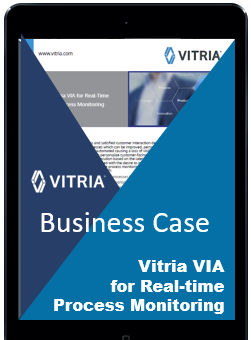 With a rich heritage as a BPM technology pioneer, Vitria’s award-winning solutions provide the backbone for many Global 2000 companies’ mission-critical business processes. Vitria has customers in North America, South America, Europe, Asia, and Australia.